2. Comfortably light weight (19.4 oz.) and compact (4.6 in). 4. All-new “RXD” stepping motor AF unit is extremely quiet and therefore perfect for video capture. 7. Compatible with the “Direct Manual Focus (DMF)” feature that enables Sony cameras to instantly switch between autofocus and manual focus. Sigma and Tamron Discontinuing Sony A-mounts Lenses in The Near Future? 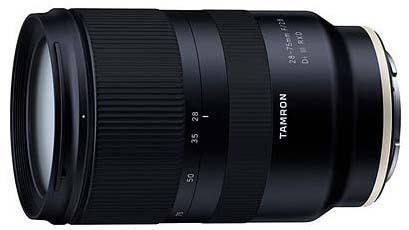 Tamron Coming to Sony E-Mount? This entry was posted in 3rd Party Lens and tagged Tamron, Tamron 28-75mm Di III RXD FE. Bookmark the permalink. Trackbacks are closed, but you can post a comment.